Dynos and timesheets Post your lastest power numbers, ETs, or lap times. 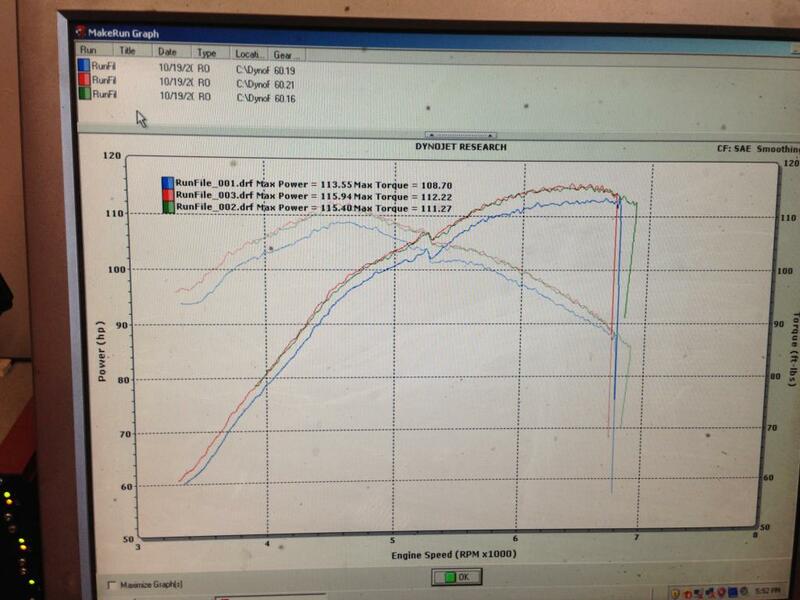 I just installed a BP5A Mazdaspeed cam and will redyno soon (at the same place) to hopefully get a decent delta. I'm curious what the differences will be between the cams. Let us know. I have a set of them on the shelf, too. Definitely! I also ordered a BP5A ecu too, to see if the cam extends the power out to 7500rpm. Luckily someone did some work to find out that it bolts in and works w/o a hitch (we'll see though). - Run with delta between my above baseline and BP5A cam. I'm doing things I wanted to see, the small incremental changes so I (others) can know what these 'smaller' mods yield. Depending on my results w/the ECU I may/may not go with some sort of standalone or really good piggyback. Last edited by Saul_Good; 11-11-2013 at 11:30 PM. Kinda disappointing results. BP5A cam with stock ecu then BP5A ecu. The first and second run i got 112hp the following runs were with the BP5 ECU (JDM ECU) where i got 116hp but lower tq and powerband from my baseline run. Baseline run and mods at top of thread. 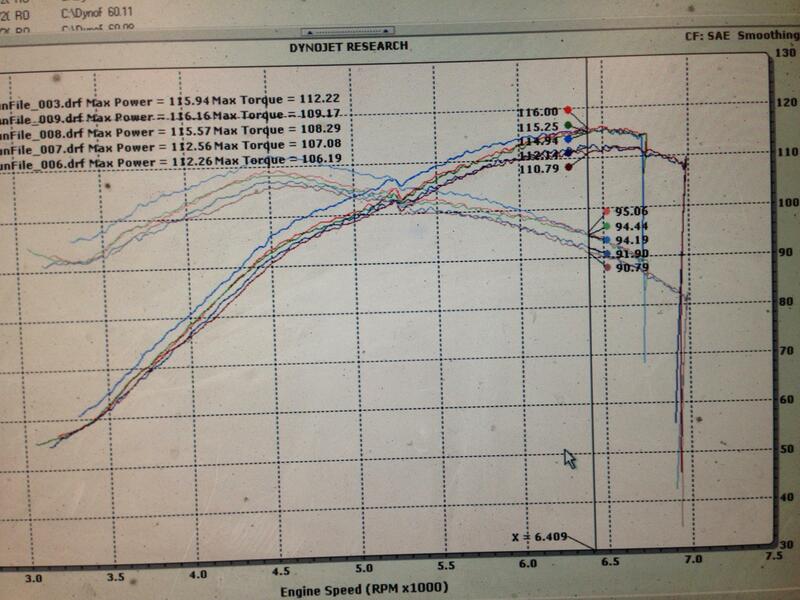 I also found it odd that the jdm ecu would fuelcut at 7k on the dyno but afterward was easily going to 7500. Also i was running the jdm ecu prior to dynoing and switched to the usdm unit before making the 5mile drive to the shop. After 2 runs i switched to the jdm ecu. Not sure if hot swapping the ecu's contributed to the loss since it didnt have time to 'learn' prior to being ran. In short, I didn't gain HP w/the BP5A cam and also have a lower overall powerband from my baseline. The JDM ECU got me back even with my baseline peak HP but also was unable to match and/or exceed my previous baseline powerband. I don't know what I was expecting, but that wasn't it. I guess I expected something more dramatic. Well that's a bummer. Long shot, but I read one incident where someone ordered an MSM cam and received a plain old 99-00 cam. Easy to overlook. Can you triple check the cam? I looked at it before getting it installed. Both the box and cam had the BP5 designation. Maybe it was just the case of the conditions although i tried to mitigate best i could, cuz i swear the car pulls stronger on the road. Going to track at a roadcourse when the weather clears up.